Massachusetts temporary staffing agencies must display this poster where it is visible for temporary workers to view. Staffing agencies must display this poster in their locations (not the worksite locations). 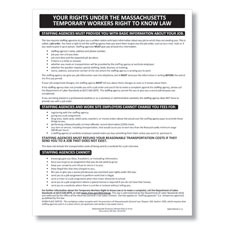 It informs employees of their rights under the Temporary Workers Right to Know Act and provides the name and contact information of the Massachusetts Department of Labor Standards, who enforces the law.